India will begin inducting its new S-400 air defense systems from October 2020 onwards, according to the Indian government. 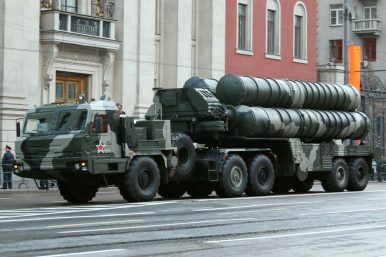 India will begin receiving its first regimental set of Russian-made Almaz-Antei S-400 Triumf air defense systems (NATO reporting name: SA-21 Growler) in October 2020, according to a senior Indian defense official. Delivery of all five S-400 air defense squadrons (regiments) from Russia is expected to be completed by April 2023. “The deliveries will commence from October 2020 and will be completed by April 2023,” Indian Minister of State for Defense Subhash Bhamre said earlier this week in response to a parliamentary question about the $5.5 billion defense contract. “The system will provide a very capable air defense coverage to vulnerable areas/vulnerable points,” the junior minister added. The S-400 deal was signed in the presence of Indian Prime Minister Narendra Modi and Russian President Vladimir Putin during the 19th India-Russia bilateral annual summit held in New Delhi on October 5, 2018. India is persisting in its decision to purchase the S-400s despite strong opposition from the United States. The U.S. government is still considering the imposition of economic sanctions on India under U.S. legislation known as the Countering America’s Adversaries Through Sanctions Act (CAATSA). CAATSA, which came into effect in January 2018, is meant to economically and financially punish countries engaging in “significant transactions” with the Russian state-owned defense industry. According to Bhamre, the Indian government is “aware of all developments that may impact” the procurement of the S-400 air defense systems. “The government takes sovereign decisions based on threat perceptions, operational and technical aspects to keep the armed forces in a state of readiness to meet the entire spectrum of security challenges,” he added. (…) China was sanctioned by the United States for taking delivery of advanced Russian military hardware in September. In detail, the U.S. imposed sanctions on the People’s Liberation Army’s Equipment Development Department for the Chinese military’s procurement of S-400 air defense systems and Sukhoi Su-35S (NATO reporting name: Flanker-E) fourth generation, twin-engine, multirole fighter aircraft. As China was sanctioned for taking delivery of the new Russian-made military hardware rather than the conclusion of a sales agreement, the United States can hold off imposing sanctions on India until at least October 2020. Furthermore, CAATSA sanctions appear to be unlikely in any case as there is a growing consensus in the U.S. government that the evolving strategic partnership with India should not be jeopardized by CAATSA. “We will work everything out. Trust me,” then-U.S. Defense Secretary James Mattis told reporters on December 3 when asked about the S-400 deal and its impact on U.S.-India defense relations. The U.S. defense secretary expressed confidence that U.S. and India will work out differences centered on CAATSA.